Flowers Made of Snow is a Various Artists compilation by the Cold Meat Industry label. Presented as a sampler of the labels current artists, the compilation covers ambient, folk, industrial and noise music across 2 CDs and 23 different artists. The first CD focuses largely on the more accessible side of Cold Meat Industry with a diverse set of neofolk, martial industrial and neoclassical songs. The Oath by Coph Nia sets the tone with a dramatic spoken word performance. The lyrics act as a proclamation for Cold Meat Industries, which are seemingly the rejection of mainstream culture and more specifically the music associated with it. Ordo Rosarius Equilibrio is the only other martial industrial band featured on Flowers Made of Snow and while the subgenre is sadly underrepresented, together they show what can be offered in their brief but powerful presence. There are 3 neoclassical nightmares courtesy of The Protagonist, In Slaughter Natives and The Last Hour. The only thing to be said for certain of the neoclassical songs is that the performers are not happy people. Between the hushed murmurs, haunting soprano wails, tense violins and bleak ambiance, you’ll feel as though you’ve found yourself in the middle of someone else’s misery in these emotive pieces. Making up about half of the first CD is a set of groups playing neofolk music that at times sounds worlds apart from each other despite being under the same umbrella. All My Faith Lost and O’lenk play low key songs with female lead singers that don’t pull any punches. In contrast Hexperos follow suit until their song (The Warm Whisper of the Wind) is warped into another neoclassical nightmare akin to The Vulture by In Slaughter Natives. Apatheia and Ataraxia both perform uncharacteristically lively songs that are like reimagining’s of medieval folk music. They both have catchy acoustic guitars and more upbeat singing styles (the latter of which sounds like a cross between chanting, yodelling and opera singing) that evens out some of the tension present in many of the other songs. Sibelian takes influence from both the neoclassical and martial industrial camps for the 9 minute mini-epic The Sin Eater. Some elements of electronic music can be heard through the sound effects and (what sounds like programmed) drumming. This conceptually links to Lie Low by Sanctum, the final song on the first CD. It is a dissonant song belonging to the power electronics subgenre of noise music. It doesn’t fit in with the rest of the music found here and acts as a disturbingly unwelcome prelude to the second CD. 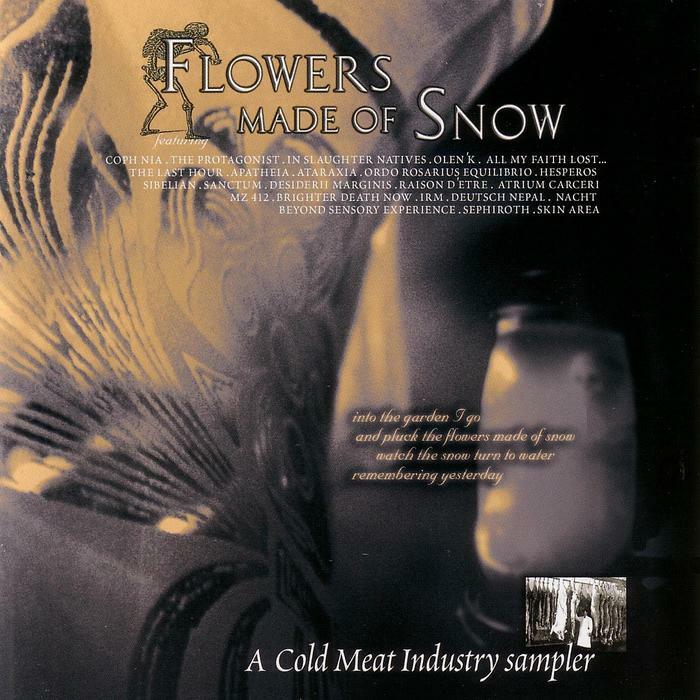 The first CD in the Flowers Made of Snow compilation does an excellent job of showcasing what Cold Meat Industries and the fringe genres of martial industrial, neoclassical and neofolk have to offer if you can stomach melancholic music in this diverse and ever twisting compilation. The second CD of the Flowers Made of Snow compilation is in stark contrast to the first. It focuses exclusively on the subtle and the abrasive (and arguably hostile) side of Cold Meat Industries in the form of dark ambient and power electronics music. It starts out harmless enough with Where I End and You Begin by Desiderii Marginis, a dark ambient song fused with soft guitar distortion and what sounds like the slow, distant groans of a didgeridoo. Raison D’etre and Atrium Carceri carry on the dark ambient themes and almost link together to create an interesting 3 part song. Mz.412, Brighter Death Now and IRM are three noise groups that work together in the same way as the dark ambient trilogy do. Unfortunately these songs are on the opposite side of the musical spectrum and are grating enough to make blood ooze profusely from every orifice on your body. Thankfully Nacht and Skin Area are the only other 2 noise groups on the CD with Deutsch Nepal, Beyond Sensory Experience and Sephiroth stepping in between these seemingly unending harsh songs to offer some relief from the discomfort they cause. You could just as easily sit in a cement mixer and get someone to bash it with crowbar to achieve the same headache inducing effect that you get from the noise songs. The only difference is that you wouldn’t need to put up with the artistic pretence to get one. The coupling of these genres provides an excellent contrast in sound if nothing else. The dark ambient songs on the second CD of the Flowers Made of Snow compilation are certainly worth a listen if you have the patience for eerie soundscapes but the noise songs should be left well alone unless you are a masochist or hate yourself.